HARTFORD, Conn. (CN) — Blaming the gunmakers for the massacre of 20 first-graders and six educators at Sandy Hook Elementary School, an attorney for some of the victims sketched out the marketing of the Bushmaster assault rifle for the Connecticut Supreme Court on Tuesday. Koskoff represents the families of nine victims as well a teacher who survived the Dec. 14, 2012, shooting in Newtown. 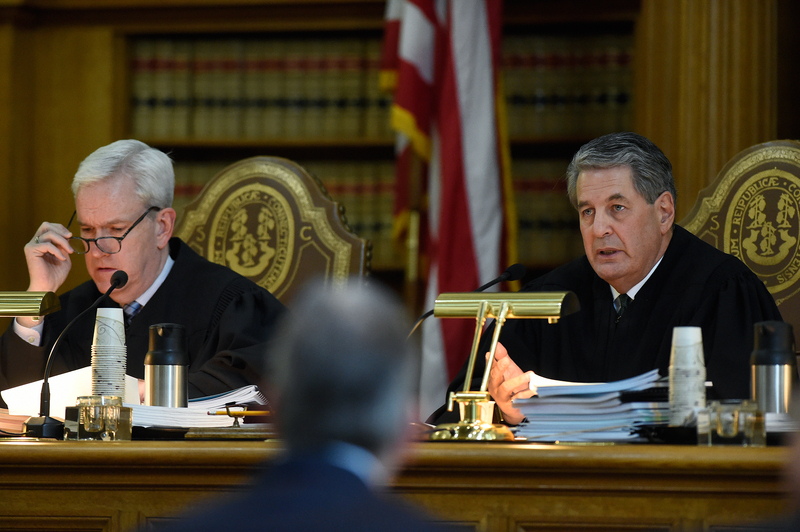 Connecticut’s high court took up the case last year after a judge threw it out, finding that the federal Protection of Lawful Commerce in Arms Act shields gunmakers from liability when their firearms are used in crime. Two years before the carnage at Sandy Hook, Lanza received the gun as an 18th birthday present from his mother, Nancy. Koskoff noted Tuesday that the Bushmaster is marketed as a military-style weapon of choice for Army rangers. Koskoff told the court that 20-year-old Lanza dressed in tactical gear for his onslaught. After firing 154 rounds in less than five minutes, Lanza used a Glock 20SF to kill himself in one of the school classrooms. “Adam Lanza heard the message and was driven specifically to the Bushmaster,” the attorney added. Nancy Lanza had been a teacher at Sandy Hook but she never made it to school that day. Lanza shot her to death that morning in her bed at the home they shared. Though Remington’s attorney disputed that an advertisement can be deemed responsible for a wrongful death, Justice Andrew McDonald asked why Remington included the message about the “forces of opposition” in its advertisement. Vogts emphasized the weapon is marketed for home defense. “I would want to choose a firearm that would force any opposition to bow down,” said Vogts, an attorney with the Chicago firm Swanson, Martin, and Bell. Vogts also argued that this specific advertising copy was not used for the gun Lanza used. The attorney likened the case against Remington to unsuccessful health claims that smokers brought over tobacco advertisements. “Under the law — federal law and Connecticut law — the manufacturers and sellers are not responsible for the crimes and the harm they cause,” Vogts said. The 2005 Protection of Lawful Commerce in Arms Act exempts Remington from claims of “negligent entrustment,” Vogts said. Vogts argued that manufacturers are insulated from negligent-entrustment claim. Koskoff, on the other hand, countered that the federal law exempts negligent entrustment and state laws related to marketing practices. Justice Richard Palmer asked whether Koskoff was asking the court to broaden its definition of negligent entrustment. Koskoff said it’s something the court should have done years ago. Asked a similar question about whether the law should be adapted to more modern times, Vogts said that’s not what the plaintiff’s are arguing. “We’re hearing that the law of negligent entrustment needs to be ignored,” Vogts said. 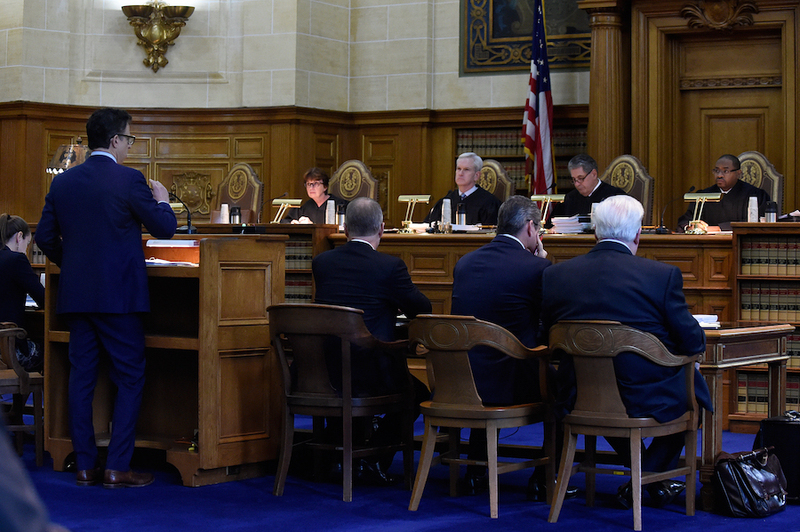 Lasting approximately 90 minutes, Tuesday’s oral arguments attracted diverse supporters from around the country, including some of the plaintiff families. “Showing an utter disregard for the lives this weapons takes and the families it destroys,” Hockley added. Remington is actively marketing its guns to people who are unstable, Hockley said. He noted that the plaintiffs have “infinite patience” to see that justice is done. Hockley’s appeal with the other families attracted amicus briefs from 16 sources, including the National Shooting Sports Foundation, which is also headquartered in Newtown, and the National Rifle Association.